March 2013 – wife. mother. awesome girl. Sorry Wednesday, I’m going to pass on bike commuting. You’d be a great test of my new cold weather gear but I have a thing against getting out from under my mid-weight down comforter to get up in the dark and cold to ride my bike to work. We had this conversation in October. The following Tuesday’s current expected high of 50*F and a low that is above freezing is much more promising for Lady Rainicorn and I. On week two of Not Being Able To Ride Because Real Life Calls. We’ve celebrated a birthday, we’ve taken the Girl Scouts to learn about our nation’s government, and also took a little time to catch up on sleep and reading (one of my long-time favorite things to do). We’ve also started roller hockey season – which is also one of my favorite times of year. It’s tough … but not as tough when it’s cold and rainy. Or cold and frozen rainy. Ah, springtime in Pennsylvania! 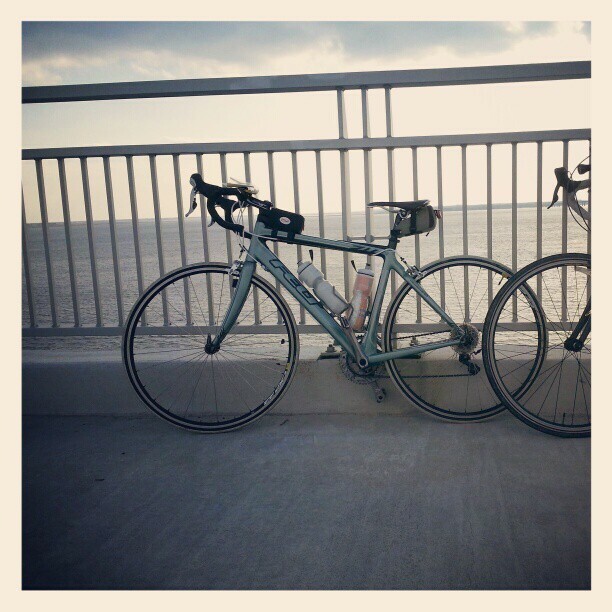 I’m thinking about how I want to structure my athletic-type endeavors – cycling, running, and yoga. I’m currently planning on cycling (for sport/fun) two days per week, running one day, and yoga one day. This of course does not take into account my bike commuting, which I want to do two or three times per week. This type of schedule will be tough until summer, when the kids don’t have any real commitments and I can maximize my personal time. Until then, I need to get running onto the calendar first. My friends all run sub-10min miles. I feel like a schlub – but you can’t get better if you don’t even get out the door. For those of you playing along at home, you know I am not a fan of freezing my toes into fish sticks when I ride in sub-freezing temperatures. This past weekend we rolled out at quarter-to-9 in the morning under cloudy skies and 28*F with winds around 15mph, gusting to 25+. In an attempt to keep my toes from freezing, I covered them into two pairs of wool socks and then stuffed my toebox with plastic bags in an effort to keep out the cold under my toe covers. By our first bathroom break a mere 10 miles in, my toes were gone. Fortunately the bathrooms were inside so I was able to warm them a bit. In all, we rode about 35 miles (I shut off my Strava after 32mi and enjoyed the short ride home) – Great ride with great company!- but I had the worst re-warming pain yet this season. Thank G-d spring is around the corner. I don’t know how much more I can take of wearing a million layers and still freezing my toes off. So last night I broke down and bought Shimano MW81 winter cycling shoes. They were on sale, which means they cost as much as my road shoes and commuter shoes combined. I also bought some thermal insoles and thermal sock liners. 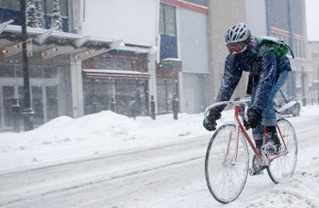 This sounds like overkill but I will not accept that I am unable to ride in the cold. this needs to be me. but with toasty toes. and brakes. It occurred to me that perhaps I should invest in a high-quality fleece-lined hardshell jacket. Three of my riding friends this weekend had hardshell jackets on over varying layers. They certainly did not look like an overstuffed sausage like I’m sure I did. I also have steel cleats … and it makes perfect sense that the metal plate is literally sucking my toes’ will to live. Happily this weekend won’t be prime for testing my new gear as it’s going to be something ridiculously awesome like 50*F and sunny. In other news, I also picked up a Garmin 510 so I can track my rides and Even More Data (like cadence!) without killing my phone battery or carrying a portable charger. Hooray! In saddle news, I’ve now put 135 miles on the Specialized Ruby and am still not convinced I need to just keep riding on it to make it better. So back to the shop this week to hopefully swap it out for something that doesn’t make me feel each individual sit bone move with every pedal stroke. Seriously – that just feels weird. seriously – look how thin it is!